– group, district, regional, provincial, world and sponsor/partner emblems and service stripes. The tails are one of three colours. The Beavers develop from brown tails to blue tails to white tails as they progress in age through the Beaver program. The colours brown and blue symbolize nature; brown for the earth and the beaver’s fur coat, and blue for the clear sky and fresh sparkling water. White is the colour of the moon and stars. They give us light to help us find our way through the darkness of the night and symbolize distant goals, seemingly far away but attainable. Other items worn on the uniform are as pictured in the image. 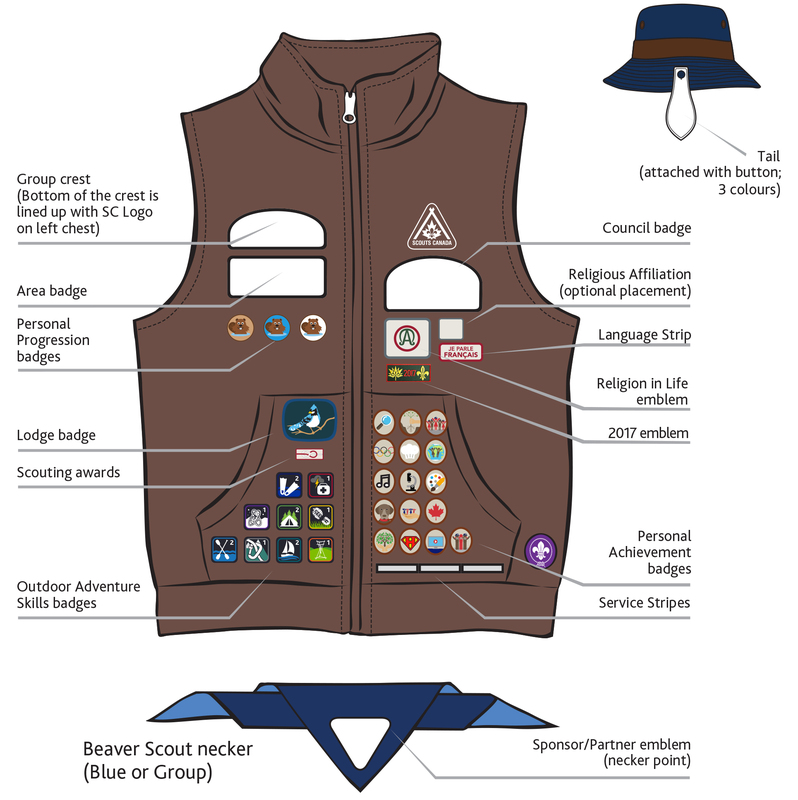 Other crests not pictured in the image are not worn on the uniform and are meant to be displayed on camp blankets, wall hangings, etc.. Before you buy talk to a Beaver Colony Scouter to find out what you need and what is optional. For example, you buy the vest and hat, but the neckerchief (necker), woggle (slide), and insignia for the 24th Kitchener will be provided at investiture. An example of optional wear is the Beaver T-shirt. Teach your Beaver to respect his/her uniform and wear it proudly. After your child is invested, encourage him/her to wear the full uniform. These items, along with other related books and accessories are available at a Scout Shop, either online of at a store location. Use the Scouts Canada Scout Shop page to purchase online or use the store locator.